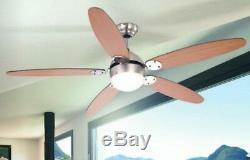 Globo Ceiling Fan Azura brushed nickel 132 cm / 52 with pull cord and light. More products, service and advice? Check our legal info for contact details. Globo Ceiling Fan Azura 132 cm / 52 with pull cord. Do you have questions about this product? We're happy to help! Please have the following item number. Ready so we can answer your questions as fast as possible. We are happy to help and are available from Monday to Friday between 7am and 4pm. 240 Volt / 50 Hertz. Diameter: 132 cm / 52 for spaces with up to 30 m². Shell colour: brushed nickel / chrome (blade holders + drop rod). Blade colour: beech / graphite (dual effect, blades can be installed both ways). Lighting: 1 x E14, max. Revolutions per minute: 85 / 135 / 185. Total height: 40,6 cm (drop rod can be shortened). Diameter motor housing: 19,5 cm / 7.7. Diameter canopy: 13,1 / 5.2. Installation on ceilings with up to 30° pitch. Forward and reverse motion (summer and winter activity). Lighting and fan can be controlled seperately with pull cord. Adaptable for remote control or wall switch (optional). Extremely smooth and quiet operating, no audible motor sounds. Weight: ca 6,1 kg. 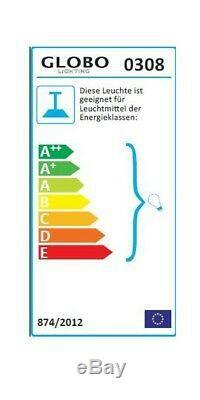 The lighting is suitable for light bulbs of energy classes A++ - E! The fitting drop rods can be found in our shop. Fast order processing is one of our core competencies. Articles that are on stock are dispatched immediately if the order is placed until 14:00. We aim to find the right product for your specific needs. Experts on ventilation and heating are available to answer any questions you might have about the products in our range, we are happy to help you make a decision. The service team is available from Monday to Friday between 7am and 4pm. Please check our legal info for contact details. The item "Globo Ceiling Fan Azura brushed nickel 132 cm / 52 with pull cord and light" is in sale since Thursday, June 8, 2017.